The first trams were horse drawn but the game stepped up when the Tramways Act made it possible for individuals to start up tram companies. 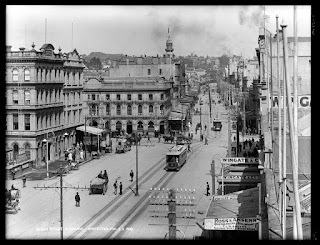 The Auckland Electric Tramways Company Limited was born in 1902, and the first electric tram made the trip from lower Queen Street, to Ponsonby, via Karangahape Road. 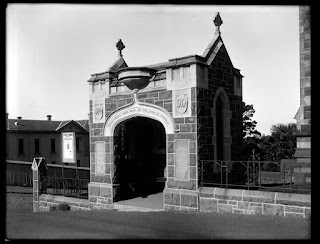 A purpose built coal station was constructed in Hobson Street to fuel the fleet. Indeed, riding the tram on steel tracks was considered luxury compared to taking buses that rode over loose metal roads with hard tyres. Ref: F.G. Radcliffe, Looking towards Mount Eden..., 1910s/1920s, Sir George Grey Special Collections, Auckland Libraries, 35-R243. From the 1920s, around 200 trams were in operation over any one year. Besides the city lines, they travelled as far out as Avondale and Owairaka, Three Kings and Mt Roskill, Onehunga and Meadowbank. By the 1930s, however, the economic depression combined with the shortage of hard materials due to the war effort meant trams were falling into disrepair. Eventually, the decision was made to replace them with diesel and trolley buses. 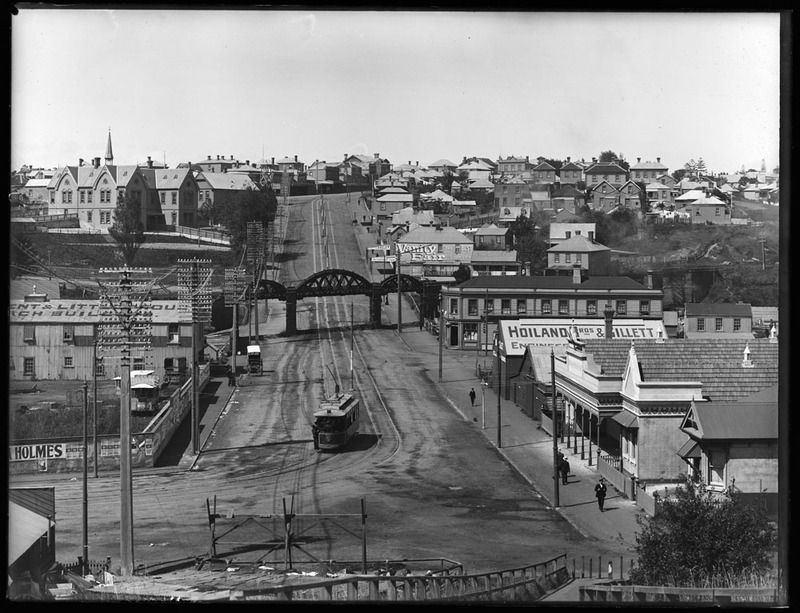 Ref: Henry Winkelmann, Looking east from Constitution Hill up Gittos Street..., 21 March 1904, Sir George Grey Special Collections, Auckland Libraries, 1-W942. Ref: F.G. Radcliffe, Queen Street, c1919, Sir George Grey Special Collections, Auckland Libraries, 35-R14. 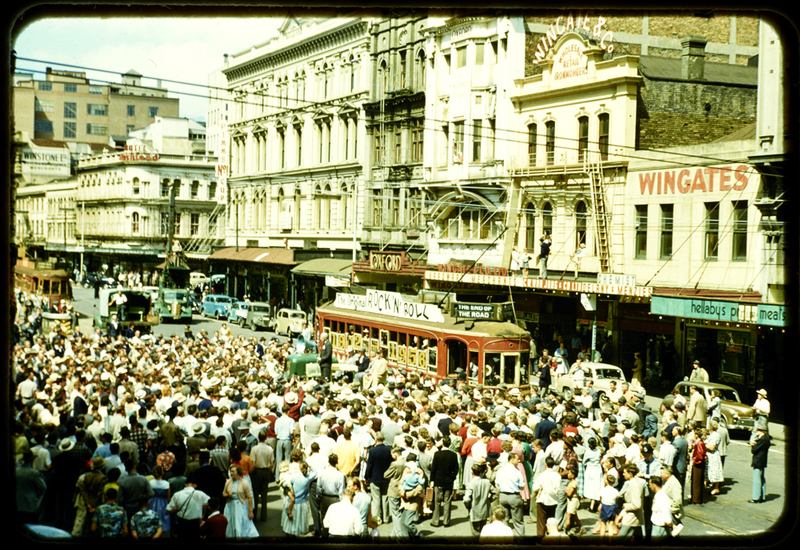 The official closing ceremony for Auckland's much loved trams was held on 29 December 1956. Five trams were included in the civic send off - among them, the last official tram - No. 242. 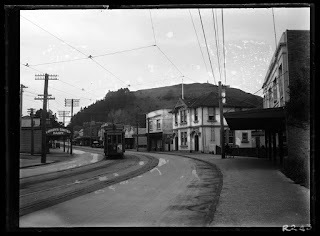 Christchurch's tramway service closed in 1954, Dunedin's in 1957, Wellington in 1964, and throughout the 1950s Wanganui, Invercargill, and New Plymouth saw the end of the trams, too. Ref: Ron Clark, The Last Tram, December 1956, Sir George Grey Special Collections, Auckland Libraries, 1207-881. 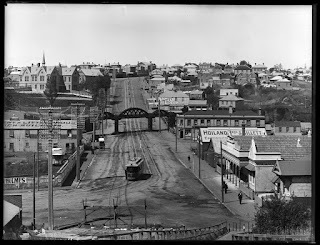 While the trams were a part of Auckland's landscape, so too were the tram shelters, such as the one in front of St Paul's Anglican Church on Symonds Street. It was built in 1920 as a memorial to the people of the parish who'd lost their lives during the First World War. In 1971 the shelter was demolished due to vandalism and no longer being needed, and the stones were placed in the church grounds. Auckland Council Archives holds a database, the St Paul's War Memorial Tram Shelter Index which lists details of those associated with the memorial. Ref: Henry Winkelmann, Showing a memorial tram shelter next to St Pauls Church, 11 April 1922, Sir George Grey Special Collections, Auckland Libraries, 1-W1825. Interestingly the architect who designed the shelter was one of Auckland's most prestigious architects, Daniel Patterson, who not only designed several ASB bank branches between the wars but also Auckland's Government House, the Mater Mercy hospital and St David's Presbyterian church in Khyber Pass. 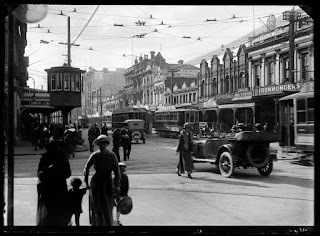 You can check out hundreds more wonderful tram photos by going to Auckland Libraries Heritage Images database and using the search word 'Trams'.